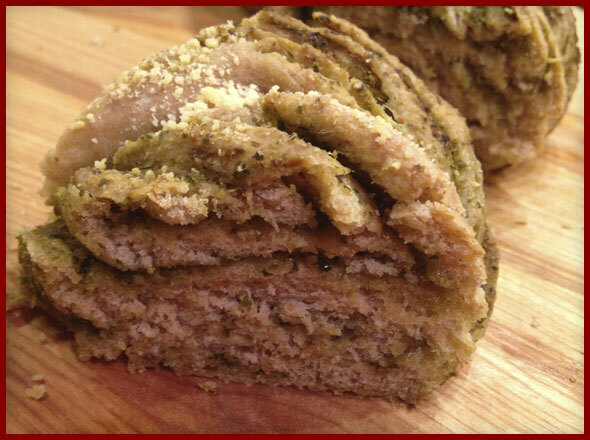 I give total props to Foodie Bride on BlogHer for her original Braided Pesto Bread recipe for the inspiration to create this healthier version of it. She made it look so good and I wanted to eat it so badly, I felt compelled to add some fiber, vitamins, minerals and cut a little of the fat. Whole Grain Flour: I started by using my trusty spelt flour, a combo of whole grain and white. Whole grain spelt is rich in vitamins, minerals and fiber. White spelt flour is simply sifted to remove some of the bran – it’s not bleached. It retains many of the vitamins and minerals of whole grain spelt, but it has less fiber. You could use whole grain spelt for the entire recipe for extreme healthfulness. 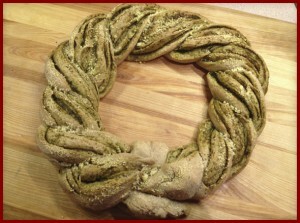 Whole grain doughs are a little trickier to work with, and the bread will taste nuttier, but it certainly can be done! Optional Cheese: The original recipe calls for parmesan cheese sprinkled on top of the bread at the end, which I don’t think it needs. The pesto has so much flavor (and has cheese in it), for me cheese is extra fat and it didn’t add much to the bread. I suggest a sprinkle of coarse sea salt instead. Your choice! Pesto: There are lots of pestos out there, use a healthy one. It can be a classic one, like my Yummy Pesto Recipe, or it can be something different like a Red Pepper Pesto, or something really healthy, like my Kale Walnut Pesto. Heat water to 90 - 95 degrees. Pour warm water into the mixing bowl of your stand mixer and sprinkle yeast on top of water. Add the flour, oil, and salt to yeast mixture. 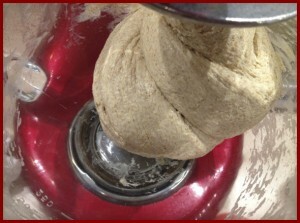 Using the dough hook turn the mixer to low. Once the ingredients are incorporated, knead the dough for 5 minutes until smooth and elastic. The dough should completely clean the bottom and sides of the bowl. If the dough is sticking to the bottom and/or sides of the bowl, add flour one tablespoon at a time until the dough pulls away. Once kneaded, form the dough into a smooth ball. 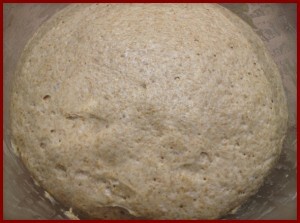 Transfer to a lightly greased bowl and let rise in a draft-free place until doubled (about 1 hour). I like to let my dough rise in an oven I'm not using. Gently stretch and elongate your dough. Roll into a rectangle, about 18x12 inches. Rolling onto a Silpat works perfectly. 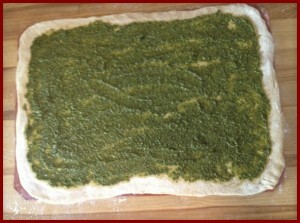 Spoon pesto over top, spreading evenly, leaving a 1/2-inch border around the edges. 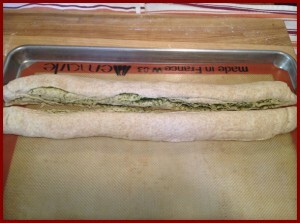 Roll the long side of the dough to you and pinch the seam closed. Transfer to your parchment (or Silpat)-lined or cornmeal-dusted baking sheet. 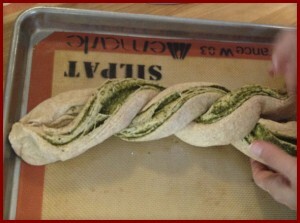 Cut the dough in half down the length of the dough and pinch the top ends together. Quickly twist the two pieces, keeping the cut ends on top. When you get to the bottom, pinch the ends together and wrap into a wreath. Top with shredded cheese (if using). Let cool slightly and slice to serve.